If you’ve been reading pencil blogs for a while you’ve probably come across Kakikata pencils before. Gunther showed some beautiful ones on his blog, nearly ten years ago, and Stephen had some nice ones, too. According to one JetPens product page Kakikata means ‘way of writing’. I can’t really comment, it’s now 20 years that I learned Japanese and I forgot virtually everything except the odd katakana ..but other sources seem to indicate that Kakikata means ‘how to write’, which seems to be a better translation, at least for the Staedtler Kakikata pencils I want to show today1. 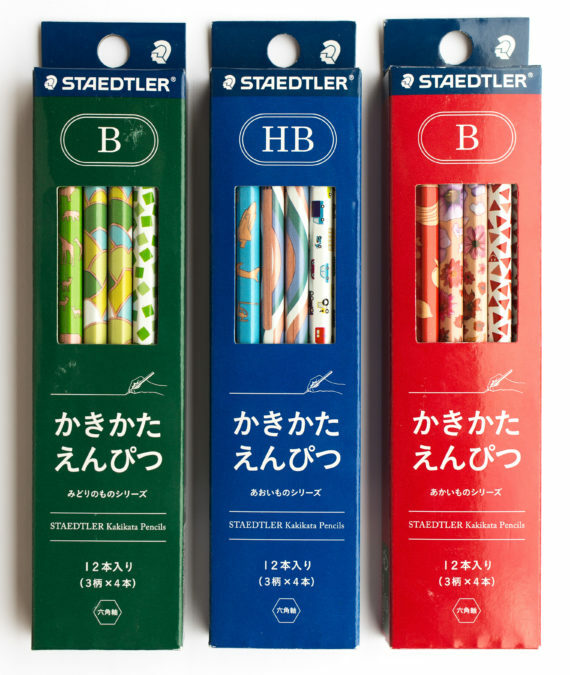 Staedler’s Kakikata pencils are made from FSC certified wood in their factory in Thailand, where Staedtler’s Norica and other pencils are made, too. I found out that they are officially being sold in Japan, Hong Kong, South Korea, Singapore, China and Taiwan, but am not sure whether they will have a different packaging outside Japan, i.e. 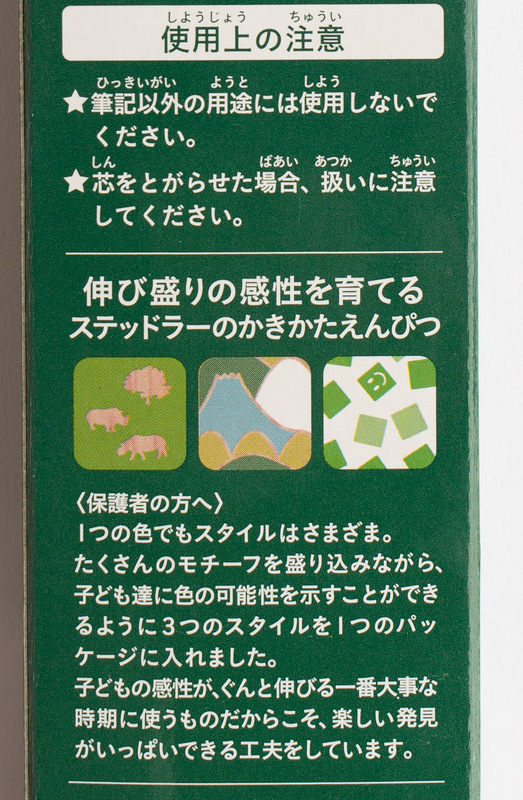 whether the box will be translated into the local language. I love how the look of the wood has been integrated into the designs of these pencils, as a background to the motifs used. There are three different packs, all available in HB, B and 2B, with three different pencil designs in each pack. The blue pack (Aorimo あおいも) is boy-themed, the red one (Akaimo あかいも) is girl-themed and the green one (Midori みどり) seems fairly gender neutral. As is common in Japan the pencils are unsharpened and since these are for children there’s also space to write the child’s name on. Near the end the body is silver or gold stamped with the lead degree (HB, B or 2B) and unlike the Noris or the Mars Lumograph that have lacquer caps the end of this Kakikata pencil is not capped. Depending on where you buy it you pay somewhere between ¥700 and ¥900 (~$7, £6; €7) for a dozen. You can find the original press release at this address, including the product numbers for they various colour and lead grade combinations. I would like to thank Claudia Förster for these pencils and for finding out in which countries they’re being sold. 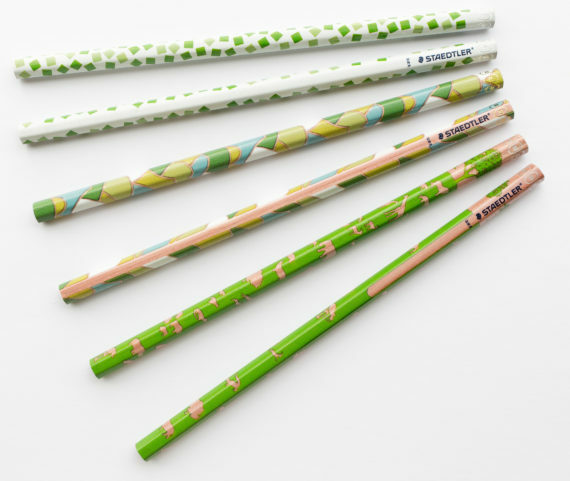 Pencil Talk has even more Kakikata pencils than the ones linked to at the beginning of this blog post, and Jinnie has some, too. If you want to have a look at a Kakikata felt tip pen have a look at Brad’s post. 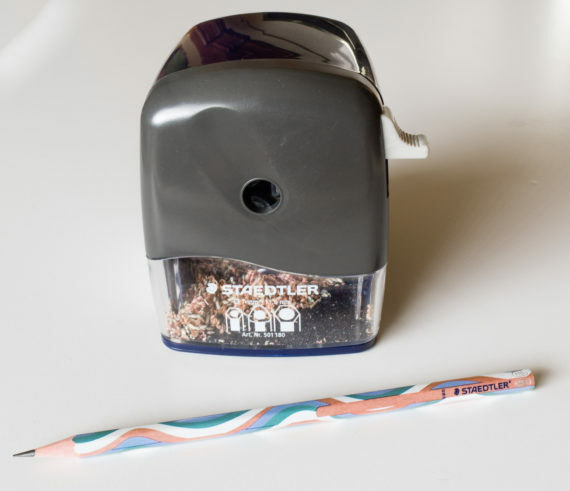 The Staedtler sharpener form the last picture has been mentioned before and I’ve made a video review, but the blog post is still waiting to be finished. There are also other unsharpened Staedtler pencils for the Japanese market. I have mentioned the Lumograph many times, so I’ll spare you the links to those videos and to Gunther’s blog post this time. Thank you for the photos (and the links). The oceanic themed pencils nicely line up! Thank you for showing these pencils and for the many details! They look quite good. My favourite is the blue wavy one. There idea of showing the wood through parts of the design is really nice.